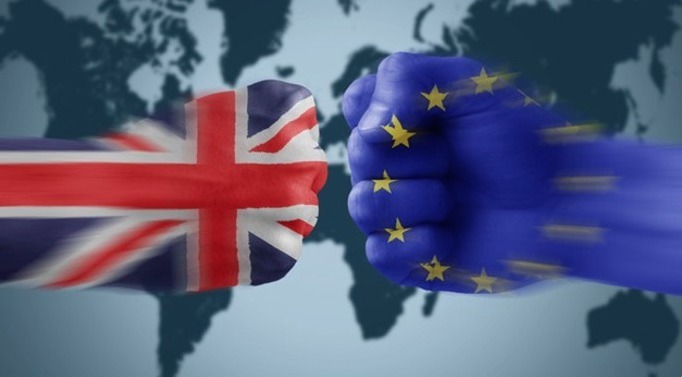 The British people seem ready to leave the European Union through a historic June 23rd referendum, because they are tired of the high-handed tyrannical regulations and clauses and counter clauses emanating from the EU Council on even the simplest aspects of their everyday lives. They have determined that leaving the EU will be the best step towards reclaiming their nation’s sovereignty and democratic rule in all matters of immigration and border control, their economy, and free trade and national security, and they are proudly waving the Union Jack, as they tell their would be masters in Brussels to “go to hell”, declaring their independence. In November 2015, U.K. Prime Minister David Cameron attempted to renegotiate a treaty change with European Union Council President Donald Tusk concerning U.K. sovereignty, trade, immigration and economic governance, but Tusk rejected it all, with the minor exception regarding the handling of a few million pounds for children’s benefits. This dismal failure of PM Cameron only offered proof that the EU was closed to any substantial moves towards reform, which created a renewed and angry momentum for the Out of Europe,Vote Leave and Brexit” movements. Corporatists, transnationalists, advocates of the UN 2030 Agenda, the BBC and the Guardinista establishment are presenting dishonest and fear-based monologues, regarding the uncertainty a U.K. exit from the EU might bring. They enjoy being able to circumvent individual nation’s policies by going through Brussels, and most of them have been made rich through their deals with the tyrannical, unelected and entrenched bosses of the European Union. Despite disingenuous conclusions from the transnationalist President Obama, does anyone really believe that a hundred years of shared security concerns and initiatives and trade agreements between the U.S. and the U.K. will be detrimentally affected by a “Yes” vote to leave the EU? What cogent thought process could people, like Lena Komileva (London economist), possibly be using when they ascribe the term “illiberal” to the British people’s desire for nationalist policies and reclaiming Britain’s sovereignty? It will not take years for the U.K. to renegotiate trade deals with the U.S., as Obama suggests, but rather only months. And, if small nations like South Korea and Chile can succeed in global markets, certainly Britain also will continue to succeed, especially since the EU already imports 45% of British exports. Membership in the EU currently costs Britain approximately $30 billion annually. Although $55 billion in austerity cuts were made by the Chancellor of the Exchequer during the last Parliament, Britain’s contribution to the EU was roughly $132 billion. Every cut in public spending could be reversed, and Britain could still pay down its deficit faster if Britain were to leave the European Union. In February, George Mason, senior vice-president of Britain’s high profile Tate and Lyle Sugars, made a mockery of claims by Britain Strong in Europe that Brexit would spell economic disaster for the U.K., when he stated, “we are absolutely certain that our business and people who work in it would have a more secure future outside the EU”. However, national security is the issue currently foremost in most Britons minds, but Eurocentrics, who believe the U.K. will be safer in the EU through cooperation on crime and terrorism, have failed to see that the EU has never been capable of agreeing on effective foreign policy. Also not taken into account, the EU recently embraced the expanded definition of “refugee” put forth by the United Nations in its 2030 Agenda. Nigel Farage, UKIP leader, warns that the U.K. will not be able to handle the upcoming surge of migrants, if it stays in the EU. He observed during the April 1st Munk Debate that “Jeane-Claude Juncker, the unelected president of the European Commission, has changed the definition of what a refugee is, to include people … from war torn areas … [and] from extreme poverty … [and] perhaps 3 billion people could possibly come to Europe [as a result]. There are also reports of Bosnia, with a population of 3.8 million, being infiltrated by Islamic State terrorists. They are buying property there, and they would be free to travel to the U.K., if Bosnia is granted EU membership. One can only imagine the palpable red-hot anger of the British people, upon hearing Martin Shulz, European Parliament president, say that he was “sad and angry [over] the undertone of national resentment” and it was “not possible” to make the changes PM Cameron wanted. Shulz added that Britain “belongs” to the EU __ really? __ just watch, wait and see. Downing Street has declared that “a vote to leave is a vote to leave”. A Leave vote will facilitate the U.K.’s departure through Article 50 of the Lisbon Treaty, and terms for Britain’s withdrawal will then be negotiated over the next two years. Over forty years ago, Britain last debated her relationship with Europe, and even then, elected officials on both the right and left, such as two of the most iconic political figures of that era — Enoch Powell and Tony Benn, campaigned against the U.K.’s membership in what was then the European Economic Community. They objected to Britain’s elected government meekly surrendering Britain’s national sovereignty to unelected foreign entities and the fundamental lack of democracy in the EU. Britons, excited and optimistic, are moving forward to reclaim a more free, prosperous, ally connected and nationally secure Britain, through their own elected officials and their own choices and wisdom, breaking free of the heavy, bureaucratic chains of the European Union. They will vote for an independent future in the world, benefiting all, and, as they shout “Hail Britannia”, they will vote to leave in June.